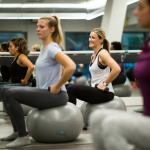 We run a variety of workshops through out the year including introductory courses in yoga, AntiGravity and barre and specialist series such as our ever popular Babies on Board and our Adult Ballet classes. Details of regular workshops are below. For information regarding start dates please contact us. In addition we’re happy to announce that we are now a licensed studio for Progressing Ballet Technique and offer this as a term course for dance students in our Jackson St and The Terrace studios. Come have fun with your baby, build strength and fitness post pregnancy with like-minded women in a friendly and supportive environment. No dance experience or babysitter required! Suitable for babies up to crawling and new mums please check with your LMC that you’re ready to start gentle exercise and come give your body some love! This gentle 2 hour Restorative Yoga workshop uses the Antigravity hammock to support the body as we work deeper to release tension and make space in body and mind. The workshop features blissful, slow and meditative movements that will leave you feeling open, lengthened, calm and ready for anything! Using a low hammock it offers accessibility to students with physical limitations, but is loved by all as a portal into deeper flexibility and mind/body connection. This class is suitable for beginners/improvers and those with childhood ballet experience wanting to reconnect with their love of dancing. 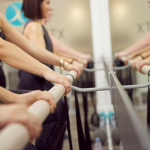 While is fine to just jump into a regular Barre class, we do understand that sometimes a little confidence goes a long way. That’s why we often run a intro 4 week beginners Barre course. You’ll learn the basic steps, moves and try out all the added extras to leave you feeling stronger, fitter and more graceful – whether you’ve ever got down before or not! Fancy trying something new? Variety is the spice of life so we try and keep things fresh with intro courses that give you a wee taste of something different. These have previously included Yoga, AntiGravity, Animal Flow and Melt Method and we look forward to sharing more lovely tasters to keep your body and brain guessing throughout the year. Keep an eye on our facebook page for details!